What do I love the best about Chanukah? So many things! What do YOU love best about Chanukah? 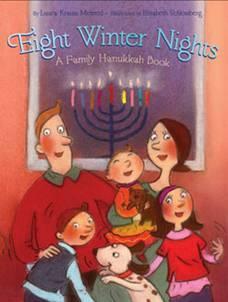 Eight Winter Nights is a collection of sweet and simple poems about Chanukah. The illustrations are also quite beautiful, soft colors as though they are lit by a menorah…And my kids loved it. *Sorry, only residents of Canada and the US are eligible for this raffle. To participate in the raffle, please submit comments before Shabbat Chanukah. I love having a reason to buy presents! I love seeing my family or at least some of them, every night as we light the many menorahs in our collection. Everyone gets to choose which one they want to light so there are always several burning. The relaxed and happy looks on their faces as we say the blessings and read from a wonderful book “These Lights are Holy”, the story of Chanuka one portion each night. And then there is Shabbat Chanukah, fresh challah, fresh latkes and jelly donuts what could be better. I love how excited my kids get to light the menorah and sing songs while Abba plays guitar. I love watching the candles burn, feeling their warmth and thinking about how Hashem is willing each of these candles to burn, just like He wills me into existence each and every second. This year, my favorite thing is that I am spending my first Chanuka with my husband (while last year this same time I was watching the candles burn and davening that this year I would watch the candles burn with him). I love our menorah, and the fact that my husband was able to find oil bowls that fit it. Happy Chanukah!! I love when my family gets together! I love seeing my toddler’s enjoyment when we light the chanukiah. I love playing chanukah songs on the piano while my husband sings. It’s geshmack. I love the Chanukah lights. Just taking some moments and looking at them. Savoring them.